Christmas is such a busy time of year and this year I had plans for some handmade gifts that never happened! So shortly after Christmas I decided I would make a start on some of next years gifts before the year got going and I forgot about them! 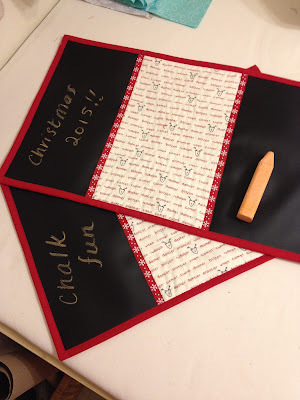 I have had some chalk cloth sitting around for well over a year with some grand plan of making placemats. So I checked our Flickr and pinterest and then just decided to make it up as I went along. I had some Sweetwater Countdown to Christmas fabrics that weren't too over the top and some Kona red. One piece had the names of the reindeer printed on it. I didn't take pictures as I went as I was so keen to sew them together. They came together really quickly. The only bit I struggled with was sewing the binding on with the machine. I usually hand sew the bind down but decided these might need to be a little more sturdy so machined the binding. I got there in the end, there's probably a technique that I am unaware of! Here's my finished placemats. They finished at roughly 17" x 11" but they are all slightly different in size! Ah well! I was originally only going to make 2 for the children of the family, but then changed my mind and decided that I'm sure adults like to play with chalk too. Hence the change in the look of them, I was running out of the adorable reindeer name fabric. This was one of the things I had listed in my FAL Q1 post! Yay to ticking one off the list! But now, where does one store Christmas gifts not needed for the next 11 months so as not to forget about them?! These are awesome! What a great idea. Have you heard of Boomerang for gmail? I use it to send myself emails whenever I think of good Christmas gifts. Gmail sends them he ever I want (like in November) so I can forget about whtvr it is until it's time to think about it again. My stash them somewhere and thn send yourself n email? My first Sew Together Bag!